A host of other changes, including better support for multi-tasking and improved links to Microsoft's Xbox game console, are also in the update. 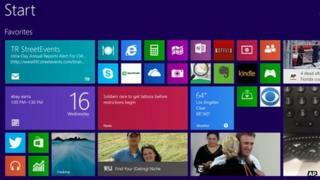 Windows 8 was created to capitalise on the growing popularity of tablets and other portable gadgets. Microsoft needs to get people using its software on these machines because sales of desktop machines are in sharp decline. Global shipments of PCs hit a five-year low in early October, according to figures from market research firm Gartner. Sales of PCs had now fallen for six quarters in a row, it added. The downward trend in sales statistics were confirmed by IDC, which added that the decline would probably continue into 2014. The shrinking sales are important for Microsoft because traditionally the bulk of its revenue comes from people and companies buying laptops and desktops and office software to run on them. It is not clear that Microsoft is adjusting to the changes in the types of gadgets that people use. In July, Microsoft wrote off $900m (£559m) following poor sales of its own-brand Surface touchscreen devices. At the same time, Microsoft has undergone a major reorganisation and has bought phone maker Nokia. It is also launching a new version of its Xbox games console and has begun searching for a new chief executive. Servers ready to dispense the update were turned on at 07:00 New York time (12:00 BST). The update is free to those already running Windows 8. Charges will apply if users upgrade to 8.1 from Windows 7. The update comes just over a year after the launch of Windows 8.